As you may know, a bad fish fillet knife can quadruple your work while simultaneously completely ruining your fish. If you are not careful or you are working with a dull knife, you just might end up filleting yourself! If you've spent hours on the water trying to catch something good for dinner, you’ll find that all of your hard work was for nothing if you totally botch the filleting. This can leave you with more bone than fish and essentially shredded fish that no one will eat. Have no fear, NomList is here! We went on a mission, not just to find the best fish fillet knife around, but to find specific types of fish fillet knives for all your needs. 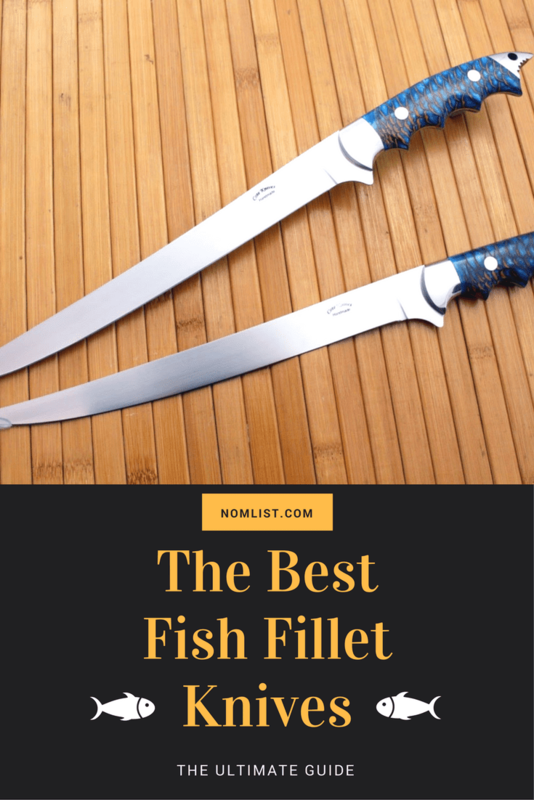 We’ve broken our categories down by style, fish fillet type, the best fish fillet knife set, and we’ve added the best accessories to go with your brand new fish fillet knives. Before we get started, keep in mind that some fish require a different type of blade to fillet correctly. For instance, there are fish fillet knives that are better for filleting salmon and those that are better for saltwater fish. If you use the wrong one, for example, a steak fillet knife for saltwater fish, you could ruin your blade – salt is corrosive for many types of metals. Never fear, we’ve got that covered too! So without further ado, here is a review of 11 fish fillet knives and accessories that top the charts on the market. Looking for the best overall fish fillet knife? We found two that we think you’ll love. Based on dozens of reviews, these are the best for all of your fish filleting needs. For best overall fish fillet knife, the top spot goes to Zelite Infinity’s high performing boning knife. This bad boy is made from highly fortified and hardened, stain and corrosion resistant, non-stick stainless steel. The blade is razor sharp for easy slicing that cuts right through fish skin like butter. Getting a tight grip on the Infinity Boning Knife is a breeze. The handle has been designed for maximum comfort and is ergonomically safe, offering elite balance in the hand. You can take this knife out on the boat, use it in a professional chef’s kitchen, or use it for everyday slicing and trimming. This blade can be used for filleting steak, slicing tomatoes, deboning chicken, carving brisket, and yes, skinning and filleting fish. This is a beautiful piece of cutlery with a lifetime warranty. If you try and don’t like it, you can return it and get your money back – guaranteed! Our next pick for best overall fish fillet knife may not look like much compared to the Infinity, but when it comes to getting the job done, the Rapala4 Soft Grip Fillet Knife takes a backseat to no one. This highly rated 4 and 5 star blade comes with a single stage sharpener and sheath for carrying this bad boy around on a hunting or fishing trip. The unique thing about the Rapala4 is that its stainless steel blade is extremely durable and yet is also flexible to give you more control when you are filleting a fish. The handle is designed to prevent slippage and is textured for maximum comfort and grip. Don’t let appearances fool you. This fish fillet knife may look understated compared to some of the others but it can hold its own performance-wise, and really, that’s the most important thing, right? Maybe you aren’t the fisher – you’re just the one who has to clean and fillet them! If that’s the case, you may want to choose one of our picks for the two best electric fish fillet knives. You can’t – or rather shouldn’t – carry your Rapala Heavy Duty Electric Fillet Knife around on a fishing trip. This handy tool is made for use in the home for expertly filleting fish. It is one of the highest rated electric fish fillet knives on the market made by one of the leading manufacturers of fish fillet knives. Bank on the fact that if Rapala made it, the materials used are top of the line and the blade, razor sharp. It has a high powered motor that triples the energy output of your typical electric fish fillet knife giving it twice the speed. When you’re done with it, no need to cut your hands washing the blades; they are dishwasher safe putting this beauty at the top of our list. The Rapala is good, but we think this Professional Grade Electric Fillet Knife by American Angler is perhaps the best electric fillet knife on the market. The Sportsmen’s Kit comes complete with 5 different blades made of highly durable stainless steel, fish fillet gloves, and a carrying case for your accessories. Talk about power, this piece of work produces 110 volts making it easier than ever to cut through bone and skin. In fact, you get twice as much power than even the highest powered of the high powered electric fish fillet knives! Say you want the speed and power of an electric fish fillet knife but you want to be able to carry it with you while you’re out fishing. No problem! We reviewed the top cordless fish fillet knives on the market and found two that we think are the best. Pack this handy dandy Lithium Ion Cordless Fillet Knife from Rapala in your camping gear and wow your friends when you whip it out. First of all, it comes with a padded case for easy, no-cut transport when you’re out in the wild. The motor works on lithium ion battery power and comes with a wall charger. It includes two different blades so that you can fillet small fish and large fish with the same knife. Once charged, the battery holds power for as long as you need it, filleting a big haul with ease. These blades are sharp and finely serrated to preserve the fresh meat while slicing through fish scales with little resistance. You can’t go wrong with this one. Notice a pattern here? We’ve said it before but the proof is in the pudding. Rapala makes some of the finest fish fillet knives around, including this expertly designed Rechargeable Cordless Electric Fillet Knife. Designed to simplify the filleting process and protect your wrists while doing it, the handle is made so that it won’t slip out of your hands. If you’re going away for a long weekend on a hunting and fishing trip, this is the best fish fillet knife to have because it comes with dual rechargeable battery packs, so you always have a backup power source. It comes with both a 6” blade and a 7.5” blade for filleting different types of fish. You have all of the power of a corded electric fillet knife with the convenience of a non-electrical fillet knife for toting around. Plan on fishing in waters filled with a variety of fish species? Then you need one of the best fish fillet knife sets with blades for all occasions. We think this one tops them all. Some fish fillet knives are good for slicing but do little for scaling and boning a fish. The BlizeTec Fillet Knife does it all. This 3-piece knife set comes with a protective sheath plus blades made for boning, scaling, and filleting fish. Use it at home or take it with you on the road – it works great anywhere! After hours of scaling and slicing, the handle stays body temperature and is designed for good grip, and the sheath case snaps right onto your belt. If you’re fishing in saltwater, the blade is made of stainless steel and coated with titanium so it avoids rust and corrosion. Despite the long handle, this fish fillet knife is lightweight. When you choose this product, you also get its lifetime warranty so that you’ll be able to enjoy it for years and years. Speaking of saltwater fishing, if those are the waters you are treading, make sure your blades are suited for it. Salt is corrosive on most metals which makes finding the best fish fillet knife for saltwater fish imperative if that’s what you plan on doing – unless of course you’re okay with throwing your money away! Hands down when it comes to the best fish fillet knife for saltwater fish, the American Angler Saltwater Fillet Kit is the way to go. It has everything you need to perfectly fillet any type of fish, including saltwater fish like bass, salmon, bluefish, and halibut. Caught some blue and redfish? This kit comes with a 4” blade for smaller fish. Got a 500 pound tuna? It has a 6” or 9” blade for that too. The knife is designed to fillet all manner of saltwater fish with precision. Included is a manual sharpener that allows you to adjust the cut for a coarse blade or a fine blade. The kit also comes with a machine washable, water-resistant apron so that you’re not traipsing around the campsite with fish guts stuck to your clothes. Pop your knife and blades in the convenient nylon carrying case and off you go for a weekend of excellent saltwater fishing! No matter how good the blade, eventually you’re going to need to sharpen it after so many uses. That’s why we went hunting for the best fish fillet knife sharpener and found two that we think you’ll really like. This manual knife sharpening stone from Whetstone is highly rated and ergonomically designed for non-slip knife sharpening. The base has an angled guide to protect your hands and the stone is double-sided and made to handle fish fillet knives in all sizes. You don’t need any special oils to treat the whetstone, water will do just fine. Whetstone made this sharpener so that it can be expertly handled by both seasoned pros and newbies alike. Plus, you can use it on your countertops without damaging them – the base is lined with a protective rubber seal. If you order this product and find it wanting, no worries, the company offers a money back guarantee if you don’t like it. Take a look at this monster! The Best Manual Stainless Steel Knife Sharpener is made for every blade in your house, not just fish filleting. It works just as well sharpening straight knives as it does serrated knives. Best of all, it won’t damage soft metal knives yet is hard enough to sharpen steel. What do you need sharpened? A paring knife? A pocket knife? Your electric fish fillet knife? It doesn’t matter; you can take any of your dull, worn out blades and make them razor sharp with this amazing sharpener. The ceramic edge helps to hone and polish newly restored blades in one fell swoop. This sharpener won’t slip and slide while you’re using it due to its non-slip bottom while also protecting your kitchen surfaces. The makers of this product are so confident that they give you a lifetime warranty and a money back guarantee if for any reason you are unsatisfied. You’ve caught your white whale of a salmon – a giant 100 pounder! The last thing you want to do is mess it up by using the wrong fish fillet knife. We’ve got you covered. Here is our pick for the best salmon fillet knife – the Wisthof Gourmet 11” Salmon Slicer. For a big fish like salmon, you’re going to need a long blade for filleting. The Wisthof Gourmet has an 11” hollow blade that is able to cut salmon into “paper thin slices.” The blade is stainless steel and angled for efficient cutting – perfect for salmon fishers everywhere. The handle is exquisitely balanced to the blade for safety and ease of use. Made by one of the top knife manufacturers in Germany, we give this salmon fillet knife top billing. Before you complete your purchase, you might want to check out some of these awesome accessories to go with your fish fillet knife. These tools help make filleting safer and easier. If you’re on the hunt for the best fish fillet knife, don’t forget to add the best accessories too! Hold it steady. The last thing you want when filleting a slippery fish is for it to wriggle and slide around on the cutting board as you work with a super sharp fillet knife. This Two-Way Fillet Board comes with a clamp to lock fish down while you scale, debone, and fillet. The bonus of buying this fillet knife sharpening kit is it comes with a pizza cutter! More than that, it comes with scissors and has a sharpener setting for all kinds of knives including bread slicers, hunting knives, butterfly knives, paring knives, and more. You fillet a fish with no gloves and you just might cut yourself or worse – walk around all day smelling like fish! Nobody wants that. Silach All-in-One fish fillet gloves solve both problems. It’s a dirty job, but someone’s gotta do it. This fish scale remover is a scraper, scale remover, and kitchen peeler all in one.